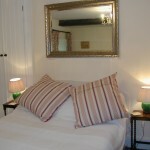 A double bedroom with its own adjoining bathroom. 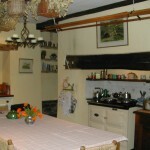 This double bedroom with its own private bathroom is on the second floor in the oldest part of the farmhouse. 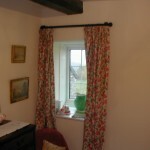 A characterful room with a sloping roof, old beams and a small window looking out to the fields and hills beyond. 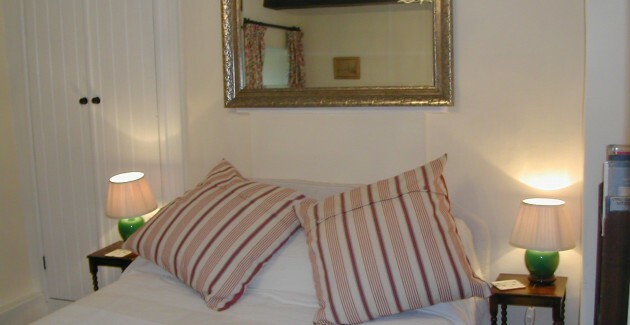 We recommend this bedroom to single guests and for double room guests under 6’2″ tall! 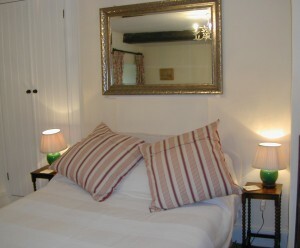 The bed is a comfortable double bed made up with cotton linen and both bath and hand towels are supplied. 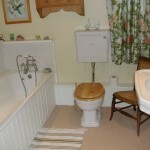 The large bathroom has a very good walk in shower as well as a decent sized bath. 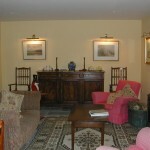 Tea or coffee and home-made cake are available in the garden room on arrival, if you are arriving at around 4pm and a tea tray is left in the bedroom for the morning. 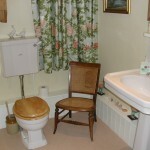 Breakfast is normally served between 7.30 and 9.00 am. We are pretty flexible about timings!